When you think of SEO, think of the Top 100 Billboard chart for your favorite genre of music. For your favorite song to be listed close to the top of the list, it needs a catchy chorus and be memorable enough for listeners to request it on the radio, download it on platforms such as Spotify, and meet other criteria known only by the Billboard. The same is true for a website: in order to be ranked high on the Top 100 Google results, a website must have a catchy hook, be clicked on frequently in the Search Engine Results Page (SERPs), and meet other criteria decided by Google. This may sound incredibly complicated and while it is definitely multifaceted, there are plenty of online tools designed for Search Engine Optimizers like yourself. SEMRush is a high-powered tool where you can track the many layers of SEO, generate reports, and review your success among many keywords (including tracked keywords and any words or phrases your website ranks in the top 100 for). Within this tool, there are Analytic Reports such as organic, advertising, and display advertising as well as research features such as keyword research, domain-vs-domain research, charts, and keyword difficulty reporting. Additionally, you can track your organic positioning, audit your website for technical issues, track and post on social media, and monitor your brand’s online reputation. One of the first steps you should take when developing your SEO campaign is to research. I always begin by researching and comparing popular phrases I believe people will use to find my website. In doing so, not only do I get an idea of where I would like to begin, but I also have the chance to learn who my organic competitors are. Organic online competitors are different than your physical competitors since the World Wide Web reaches a wider audience than just your locality. As you can see, there are over 27,000 searches related to your seed keyword, an average difficulty of 8.04%, and over 2,000 options for keyword phrases. This amount of research would take hours to do by hand, but with SEMRush by your side, it only takes moments to build a cohesive list of keywords to examine to find what may work best for your site. Keyword research is not a one-size-fits-all and SEMRush’s Keyword Magic Tool respects that. Remember: Keyword volume is subjective based on your niche. 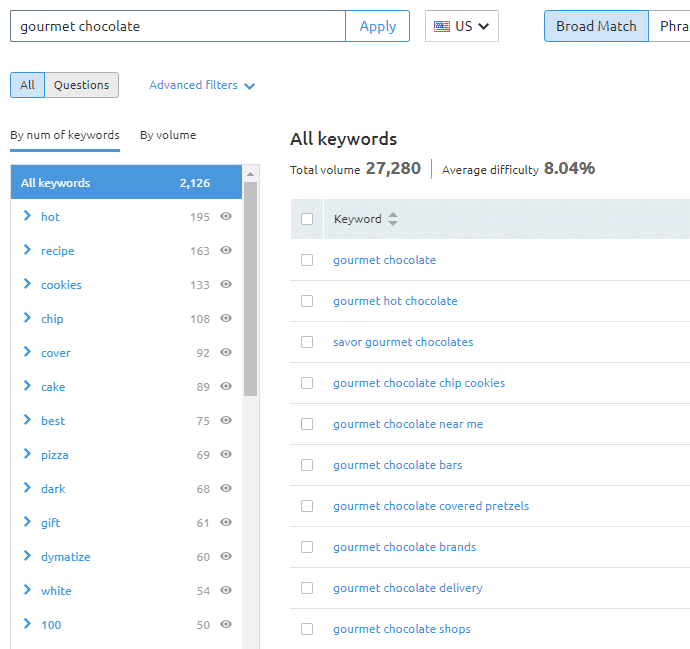 Some keywords may have a low search volume like “Tulsa Gourmet Chocolate” but when you consider the number based on the market, you should have a good understanding of how that search volume may work for your area. Additionally, you’ll be able to view any search results that appear in the Top 100 on the SERPs. This data will be presented with your current position, the search volume for that keyword or phrase, a difficulty percentage for ranking, cost per click for AdWords research, which URL was landed on for that search, and what percentage of traffic to your site came from it. There is also competitor data listed here too! Check it out for yourself. Another important aspect of SEO and researching for your campaign is not only knowing your audience but being aware of your competition. 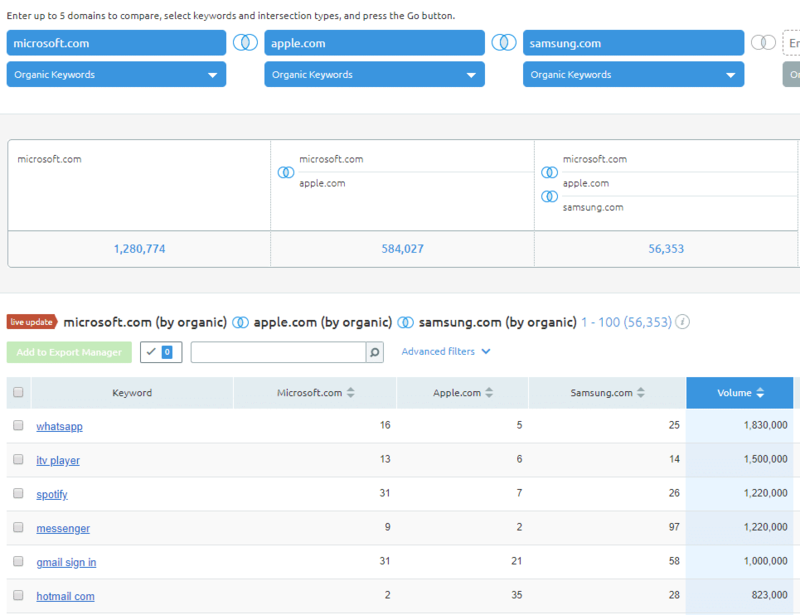 SEMRush’s Domain vs. Domain tool allows you to set up side-by-side domains for comparison, view the competition’s most common and unique keywords, and visualize the data to understand the performance of your webpage versus theirs. Understanding how your competitor’s campaign functions will help you to optimize your website to outperform their site. This is an overview of the most popular and useful tools in SEMRush, but I barely brushed the surface of the services that this powerful tool offers to help you have a highly successful SEO campaign. For more information about SEMRush, check out their blog for a breakdown of their product as well as a wide variety of SEO topics. There are many tools out there that can help you develop your company’s organic footprint and to help bring you closer to that coveted number one spot on the SERP. As always, Momentum3 Growth is here to help you develop your SEO campaign and if you are not a DIY type, we are happy to take the wheel and help drive your business forward.